Patients undergoing Radiation Therapy have difficulties in eating their normal diet due to various factors. Maintaining good health during the course of Radiation Therapy is very important. The side effects due to Radiation Therapy can very well be minimized following the tips and tricks being recommended here. The following tips will help the patients and caretaker of the patients. 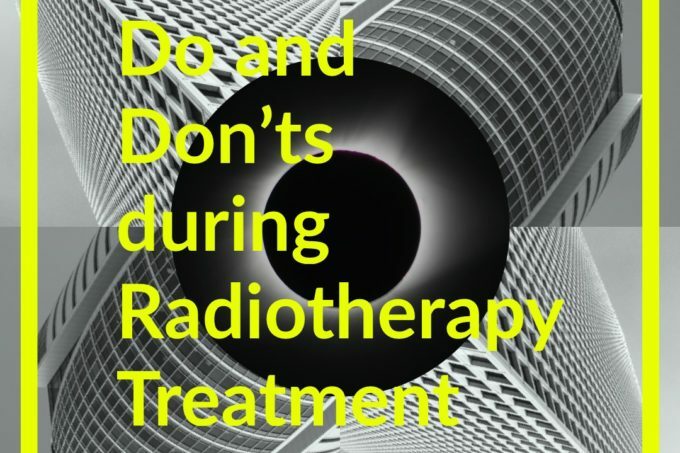 Do’s and Don’ts during Radiotherapy Treatment heading will teach you full guidance to go through the Standard practices and following. Maintaining good hygiene during the course of Radiation Therapy is important. Radiation therapy may cause nauseating smell on the body, then it is necessary to take bath daily and brush teeth and keep yourself clean is important. Keeping yourself fit by doing regular exercises and other things such as yoga and physical activity will help you develop immunity and fight against the disease becomes more strong. Avoid taking medications without consulting the Doctor instead ring up to the Doctor and ask for his advice. Short trips to nearby places, visiting the known and exploring the unknown will serve as a good hobby. Avoid alcoholic drinks and smoking during the course of Radiation Therapy as it may affect the Treatment adversely. Instead try for dry fruits, nuts, and fresh veggies. Maximum avoid all milk products, alternative to this can be warm water, fresh juices without milk. Avoid chips, bread and snacks instead try fruit salads, vegetable salads, boiled green leaves, boiled or scrambled eggs. Taking bath in warm water, not Hot water. Avoid direct sunlight on the area of treatment instead run flow of air on the treatment area. Sitting under a fan or direct flow of air on to the treatment area. Gym, make it a time to cherish and avoid thinking about it instead of disease.